Slim calf fit. Ladies Brown Knee High Boots. Circumference top:12"(31cm). half zip fastening. Length boots from heel to top:14"(35cm). High Heel:4"(10cm). full lined. 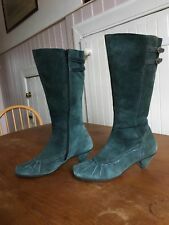 Woman's knee high boots. never been used outside only tried on. Mid Calf Boots. Circumference top:13"(33cm). Length boots back from heel to top :11"(28cm). Fabric: Real leather upper. Colour : Burgundy. Size: 6 Uk (39 Eur) (8.5 Usa) (7 Aus). Fully lined ,light padded. Used - slightly scuffed toes otherwise good condition. • Ladies & Gents clothes & boxed shoes. • Our commission, 50% of final sale price. - 50% for new goods. Black suede ankle boots, mid heel with zipped side.